We have received word of the following event from the Paulus Institute and Juventutem D.C. The Most Reverend Athanasius Schneider, O.R.C. was born in 1961 in Kirghistan (Central Asia) of German parents. In 1973, he emigrated to Germany, and was ordained a priest in 1990. In 1997, he received his doctorate in Patrology from the Augustinianum in Rome; and in 1999, he was appointed professor in the Major Seminary in Karaganda, Kazakhstan, in central Asia. In 2006, he was named auxiliary bishop of the Roman Catholic Archdiocese of Maria Santissima in Astana, Kazakhstan, and titular bishop of Celerina. Since 2010, he has been the the general secretary of the Kazakh bishops’ conference. The Paulus Institute was established for the purpose of propagating the Sacred Liturgy of the Roman Catholic Church, and seeks to do this by undertaking events of impact and significance in the Church. Most recently it sponsored the Pontifical Mass for Nellie Grey celebrated by Bishop Thomas Paprocki, after the March for Life last month at St. Mary’s in Washington, D.C..To learn more about the Paulus Institute and its mission, please visit https://www.thepaulusinstitute.org/. If you live in the greater Washington-Baltimore region, this is a great opportunity to hear one of the Church’s most courageous prelates. 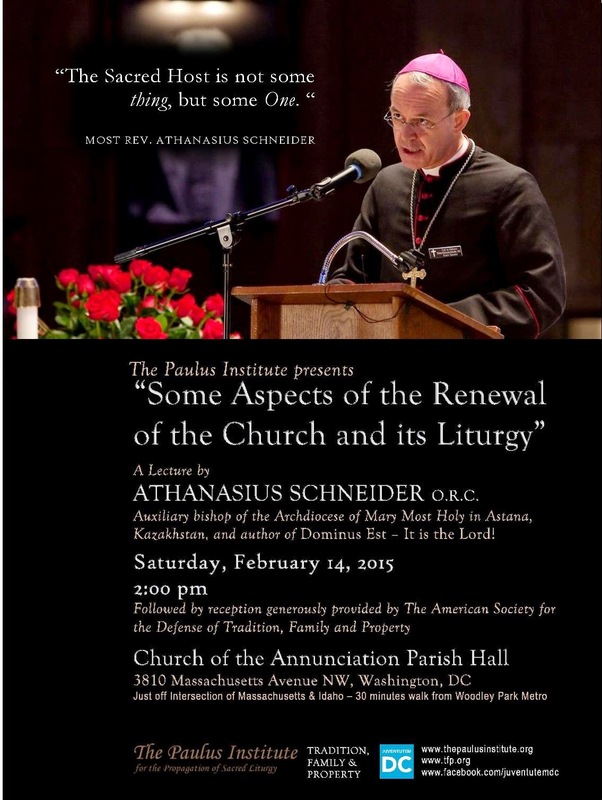 For more information and updates on Bishop Schneider's visit, please visit Juventutem DC’s event page.